Most of the time living in Haiti its so easy to complain. There are so many things to complain about...the road, the constant sweating, mosquitoes, being stared at etc etc Anyway this post is supposed to be the opposite of that so I won't complain anymore! Its been hard adjusting back to life in Haiti and I've had a hard time seeing the positives and where God is working but over this past week I've been looking and want to share a couple stories with you. Last Friday we had an old man come in for physio. He had had a stroke in 2014 and a neighbour told him to come to Bethesda for physio. We got talking and this man told us his story. He is from Port au Prince but left come to Cap for a job in 2006 and has not heard from his children since then. After his stroke he has been unable to work and now a friend gives him somewhere to sleep and other friends give him some food. He suffers from diabetes and high blood pressure (on Friday his BP was 180/100!) and his feet were incredibly swollen. He doesn't have the means to go to any doctor so both are uncontrolled. Altidor and I quickly realised his main problem could not be helped by physio. I spoke to Dr Rodney about his care and he wrote a note that Bethesda would pay for his care. The next day he returned for a consultation where he received the medicine he needs for both blood pressure and diabetes. What is even better about this is he can come back every month and get the medicine free of charge. This is only because of our indigent care fund which enables Bethesda to help those people who are really poor and cannot afford medical treatment. Next was a patient I treated in January. She had been ill for about 8 months with extreme back pain and leg pain, gradually loosing strength in her legs and now unable to walk with out a zimmer frame. She is only in her early 40's and had been to many doctors and was now going to a neurologist but was not improving at all. I only treated her twice before she returned to Port au Prince to keep going to the neurologist. She came back this week walking independently! I couldn't believe when she walked in. We asked what happened. She told us she had been to a neurologist, then a orthopaedic doctor, but neither made any difference. After that she said she 'did another thing' but wouldn't tell us what that was, which usually means she went to a witch doctor. Later I was taking a full assessment and she repeated about the doctors then she told me she just prayed and prayed and every day she saw people around her getting up and walking. One day she heard a voice inside saying she could get up and walk so she did. And from that day she has not used her zimmer frame. It truly sounded like a miracle but why not tell us what happened in between, what was the 'other thing'? I went home pretty confused. She went to a witch doctor but then believed God healed her. How can I sit with her and tell her its really a miracle that she is better but not know the whole story. I was also quite discouraged. How do I know if people are telling me the truth or not or are they just telling me what they think I want to hear? She has been coming back for exercise every couple of days and one of the days it was just her and Altidor and Altidor got the full story. This patients family had been paying for her medical care and they were fed up spending money when they didn't see her getting any better. They kept telling her go to the witch doctor, go to the witch doctor, go to the witch doctor. Finally just to keep them happy she went but she remembered her father always told her to never go. But when she went she told him I don't believe in anything you do and I will never take anything you give me. I believe that only God has power and only he can heal me. Needless to say the witch doctor was angry but her family were satisfied she went. She continued to pray and one day she was listening to a christian radio station and that's when she heard the voice to get up and walk. So she sat on the edge of her bed, held onto the wall and stood and felt good so she took a few steps and felt good. All the pain she had been experiencing had gone. She had been healed. 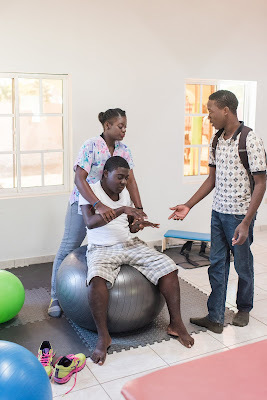 Her legs are still very weak and a little unsteady but her pain is gone, she is able to walk on her own without the help of a zimmer or walking stick. God has truly healed her. I am so thankful to be able to work alongside Altidor who helps me so much with language difficulties, explaining exercises to patients and cultural understanding of many many things! In January 2017, Emmaus Biblical Seminary celebrated its 50th anniversary. This was a time of rejoicing and thanksgiving for God's grace that enabled Emmaus to fulfill its mission to develop Christ-like leaders for the transformation of Haiti and the world for five decades! The 50th anniversary was not only a time of celebration, but also a time of deep reflection and prayer. While looking back on what God has accomplished through Emmaus in the past, we are looking forward to God's plans for the future of Emmaus. How can Emmaus be strategically positioned to be even more effective in fulfilling its God-given mission? How can Emmaus make an even greater impact for the Kingdom in Haiti in the fifty years to come? In exploring the will of God through prayer and dialogue with Emmaus stakeholders (including current leadership, students, alumni, and donors) the Emmaus Biblical Seminary Board of Trustees unanimously approved changing the name of the institution from Emmaus Biblical Seminary to Emmaus University of Haiti, effective January 1, 2019. Of course, theological training for local church leaders will continue to be the core engine and institutional distinctive of Emmaus! The Emmaus Board of Trustees is unwaveringly fixed on theological training as the center of all that Emmaus does. So why the name change? The stated mission of Emmaus is to develop Christ-like leaders for the transformation of Haiti and the world. This mission is not limited to local church leadership. Through the past number of months, the Emmaus community came to the clear sense that God is calling Emmaus to develop Christ-like leaders not only for the church, but also for other sectors in Haitian society. Haiti needs Christ-like leaders in politics, in education, and in the business sector. In 2017, Emmaus launched a Master of Education in Instruction and Administration (MEIA). This was our fleece. We wanted to "feel out" what we were sensing from the Holy Spirit by doing a trial run at a degree program for leaders in a sector of society not limited to local church/theological leadership. Over a very short period of time and with very little campaigning for recruitment for the MEIA program, we had a record enrollment of nearly forty students in our very first cohort! This record enrollment and hunger for leadership development in the sector of education helped us realize the urgency for competent leaders in education. In January 2019, we will be starting our second cohort (also with a very healthy enrollment) in the MEIA program, thanks be to God. We are excited about the future, and we are excited about being a part of God's work to bring about real and lasting transformation in Haiti through leadership development! We invite you to join us as we diligently work, by God's grace and power, to reach optimal effectiveness in fulfilling our mission to develop Christ-like leaders for Haiti and the world. Join us as developing Christ-like leaders for Haiti and the world continues TODAY at Emmaus.